Back in January we got our first hands-on with the Roost at CES, but anyone who’s ever used a 9-volt battery is already familiar with the product. 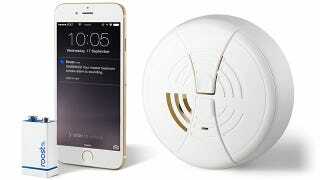 The only difference is that this 9-volt includes built-in wifi to give your standard smoke detector the ability to send alerts to your smartphone. Once paired with a free accompanying app using a clever process where the battery listens for a special coded tone from a mobile device, the Roost plugs into any smoke detector, carbon monoxide detector, or even water leak detector that accepts a standard 9-volt battery. It stays connected to your home’s wifi network at all times, and when it hears the detector’s alarm sound, it automatically sends out a mobile alert to whatever devices you have configured in your Roost account—be it your phone, your partner’s, or even your neighbor’s. It is hands down the easiest way to add smart features to all the 9-volt powered safety detectors in your home without having to replace them. And the batteries are finally available to consumers from Roost’s website, or Amazon, shipping sometime in September. Individually they’ll sell for $35 each, with no subscription to an online service required. You can also get two-packs at a slightly discounted $65. Like regular 9-volts the Roost battery will die after a few years, but they thankfully don’t need to be completely replaced. It actually splits in two letting you swap out just the battery section with a $15 replacement to keep it running. There’s a good chance that if you were to buy your parents a smart home system, you’d be spending a lot of time on the phone helping them to set it up. But the Roost is designed to be as easy to use as the 9-volt batteries it’s designed to replace.